Personally, I don’t like my curriculum telling me exactly what to say and do. Maybe I have other things to say than my curriculum does about Christopher Columbus, the Civil War, or the ecology movement. Maybe I don’t want my kids to do all those activities each week. Isn’t there ever any time for them to just… play?! If you are just starting out homeschooling, you might want a curriculum to tell you exactly what to say, what to do and when to do it. There’s no shame in that. In fact, that’s why we created Daily Lesson Plans from our original Unit Program curriculum — for moms who want and prefer that kind of structure. But if you have homeschooled awhile you may feel you don’t need that much structure anymore. You might be ready for a more unstructured homeschool curriculum. Maybe as a Charlotte Mason mom, you want to let your kids form their OWN relationships with the concepts they are reading about, without needing a textbook to spoon feed them everything you want them to know. 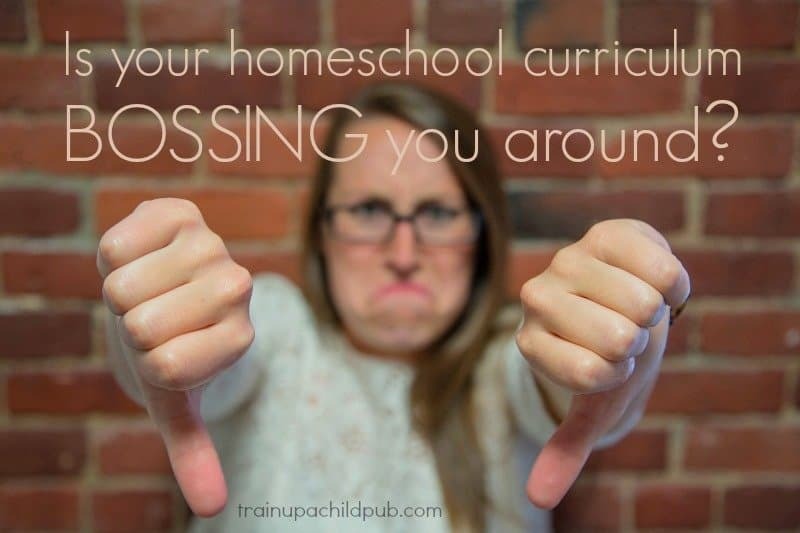 Unstructured Homeschool Curriculum can work FOR YOU, instead of bossing you around. With this tyrant in your home, your homeschooling is not turning out to be nearly as fun as you imagined it would be, is it? You’re skipping all the fun stuff in order to get all those dumb boxes checked! If you’d like to relieve the pressure before you blow a gasket, have more flexibility to go down those rabbit trails without feeling guilty, and make homeschooling FUN again, you can! “I came across this gem several years ago as I was searching for a Charlotte Mason-style curriculum that would work with well with our notebooking pages and philosophy of education. True to its Charlotte Mason roots, Train up a Child Publishing has tossed the dry, dusty textbooks and carefully selected the best available “living” children’s literature to recommend with their integrated study of history, science, fine arts and language arts (grammar, spelling, vocabulary, composition, literature study, poetry, etc.). “I love the Unit Programs’ FLEXIBILITY!!!! We can dig deep and do lots of writing and projects with each unit or at a bare minimum, just read some of the books listed – all depending on how busy the rest of our life is at the time. The kids LOVE the books. Also, I can teach multiple children of differing grades very easily with it. I will recommend this program [because it is] fun, flexible and far out! (I was trying to think of an F word that meant it’s awesome and good quality. )” ~Julie Y. Maybe it’s time for you to try a more unstructured curriculum. Then YOU can add the structure when and where you need it. We show you how to choose copywork, how to teach your kids to do narrations, and how to use the same books you’re using in history and science to teach grammar and punctuation. Each of our unit programs has over 400 top-notch, pre-read book suggestions, divided by historical period, subject (history, science, and fine arts [music, art and architecture], topic and reading/listening levels. Each historical unit also contains a 3-10 page overview of important events and people for that unit. Our manuals include checklists of important English Skills for different grades, including phonics, so you don’t miss anything important. Each unit has a page of history and science activities and projects to choose from, and our middle school and high school unit programs also have many assignment ideas as well! With this unstructured homeschool curriculum, you can cover what you want to cover each day and journal what you did, rather than obsessing about what you didn’t do! If your homeschool could use more flexibility and a little more fun, read more about our Unit Programs and click on the individual components at the bottom of the page to see samples for each level. It might be time to toss that limiting checkbox curriculum that is cramping your style! Are you ready to give more unstructured homeschool curriculum a try? If you’ve been homeschooling awhile and want to make your homeschool more relaxed, try our Unit Programs!